I am using a python script to replicate the monthly UMD factor, disregarding small caps (ie, focusing only on the "BIG HiPRIOR" and "BIG LoPRIOR" sub-portfolios in prof. French's website). 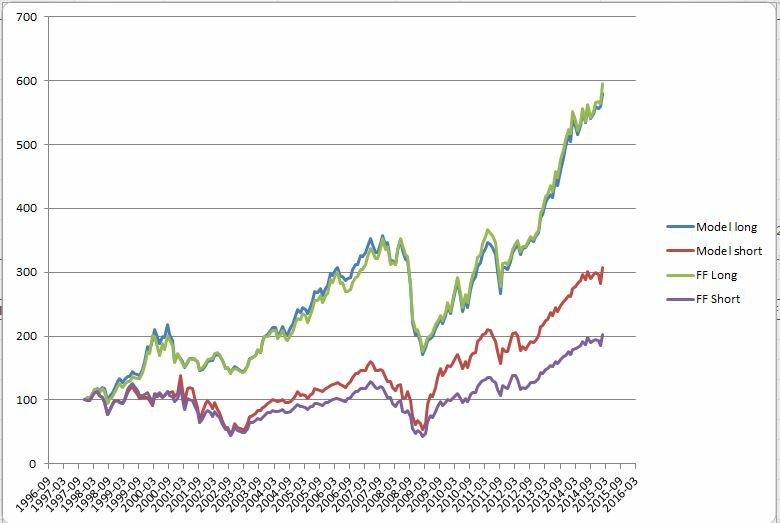 For that purpose, I am mapping the universe of stocks to the Russell 1000, which has a good fit in terms of market cap cut-off, and downloading data from Bloomberg for the relevant constituents over the 1997-2015 period. I then follow the methodology described in prof. French's website (sort 12-2 returns, take upper and bottom 30%, etc.). Here is the issue: the risk free rate was never part of the original dataset I downloaded from Bloomberg (all I downloaded was individual stock returns for the index constituents over the relevant period). Therefore it is not possible that an error in my code would have introduced that consistent bias over time on one portfolio but not the other. The risk free data simply didn't exist as far as my model is concerned. So at this point I am completely at a loss to explain this issue. On the one hand, I find it impossible to believe that there'd be an issue with prof. French's rigorous calculations; on the other hand I can't explain how such a precise bias (monthly risk free rate at each point in time over a period of 18 years, affecting only the LoPrior portfolio) could have crept into my model if that data simply did not exist when I ran the model. Could I ask, to put me out of my misery, if anyone has gone through a similar exercise and successfully replicated each of the sub-portfolios used in the construction of the UMD factor? Many thanks in advance for any help/clarity anyone could shed on this topic! 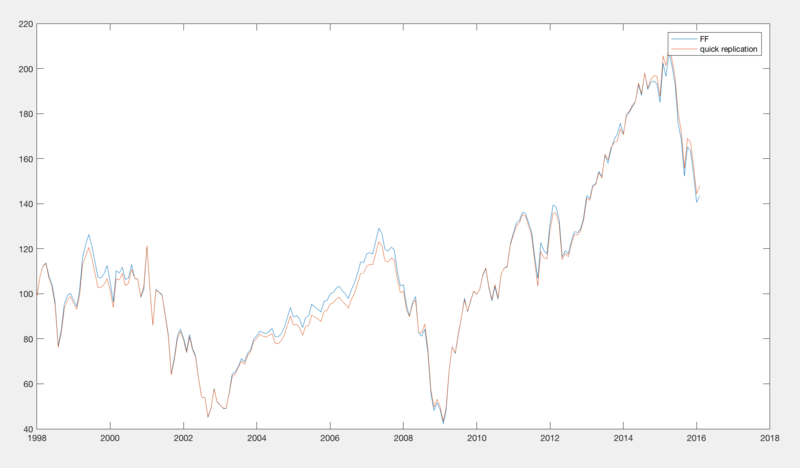 Out of curiosity, I took a quick stab at replicating the Fama-French portfolios using CRSP data. I seem to be getting numbers reasonably close to Fama-French, so I think the issue is on your end. It's also possible though the difference is due to using the Russell 1000 rather than the full CRSP universe. That doesn't strike me as crazy. I'm for sure not matching Fama-French methodology exactly. Don't take my numbers etc... as gospel. I did this quickly. Here's my preliminary replication of the equal weight, big size, low prior return portfolio (and comparison to Fama French). 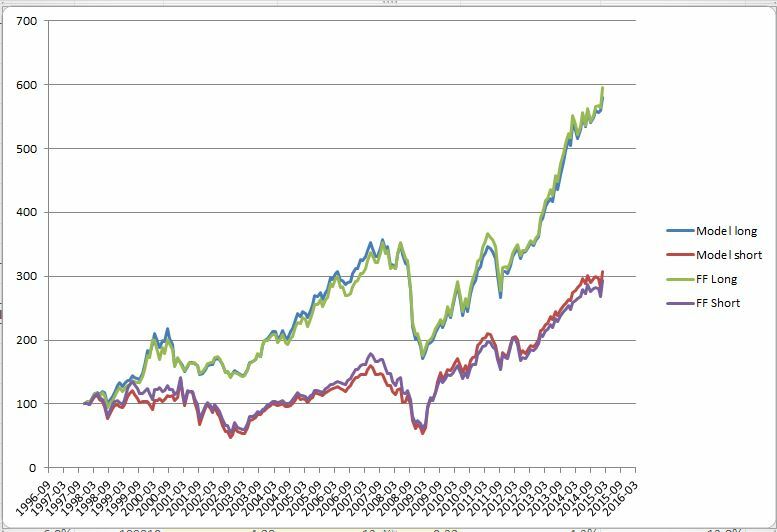 There might be an issue that you don't have companies with horrible, prior returns in the Russel 1000 because if they had horrible prior returns they would leave the index! Corollary: you could be doing everything right, but you'll need the full universe to replicate Fama-French. I'm using my own computed breakpoints for prior returns (in the link above), but if you're trying to match Fama-French, I'd just use their breakpoints which appear to be available at the above link. Another obvious point that I thought I'd mention is that to compute value weight returns, you want to use the 1 month lagged market cap (eg. February return gets the weight of the end of January market cap). Not the answer you're looking for? Browse other questions tagged factor-models fama-french or ask your own question.